* Oversize Edition not available in Sepia. ** For Full color Oversize Edition choose 21″ x 40″ media size. Media Size Choose an option21" x 40"24" x 32"
Continuing the journey on the 2013 cruise. 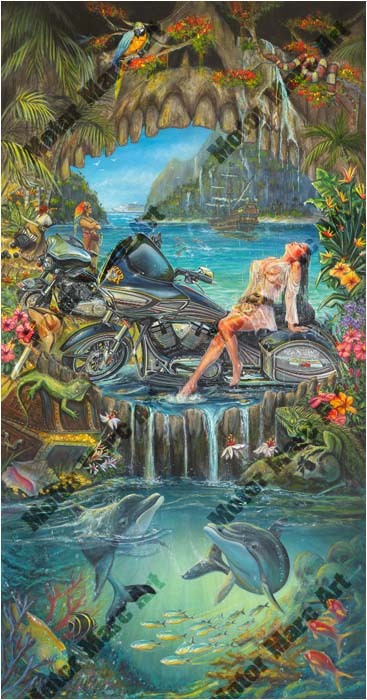 Motor Marc takes you on a calm and wild excursion with his Hidden Treasures fine art series. The leader of great power and strength surrenders herself to an oasis hidden from the rest of the world. Secluded behind cave walls, created from bones of all those who could not withstand the intensity of the sea, lies a serenity of beauty. Our slave girl, now the most admired pirate of all, falls victim herself to the song of the birds, the rhythm of the water falls and the aroma of all the nature that surrounds her. Her ship anchored at the edge of the lagoon, created by an ever growing and ever larger reef is guarded by her crew, her forest and the ocean’s creatures below her. She releases her worries and basks in the sun with her treasured iron horse. This limited edition print is very special … Motor Marc decided he again would produce this “new” look recalled from the past. Did you know in the 1880s, pirate times sepia was produced by adding a pigment, called sepia, made from the “Sepia officinalis cuttlefish” which is found in the English channel. This was added to the positive print of a photograph to create the Sepia style print . Marc has captured the same look by recreating this special effect in his art print. This is truly a collector’s low edition print. This edition measures 21″ x 40″ and contains additional scenery hidden beneath the ocean’s surface, awaiting your discovery. 21" x 40", 24" x 32"